Despite President Obama's grandly unifying speech this week, Arizona is still one of the most divided states in the nation - an epicenter of the kind of overheated partisan bickering that is tearing the fabric of the nation. That some of this is actually their own fault doesn't help matters. Just a week after the horrific shooting of Gabby Giffords and 18 other innocent citizens in Tucson, in their wisdom a group called Crossroads of the West went ahead with a scheduled gun show and a crowd of 4,000 showed up. Reports say the mood was less upbeat than usual. Perhaps that's because they could sense most of the nation's incredulity. 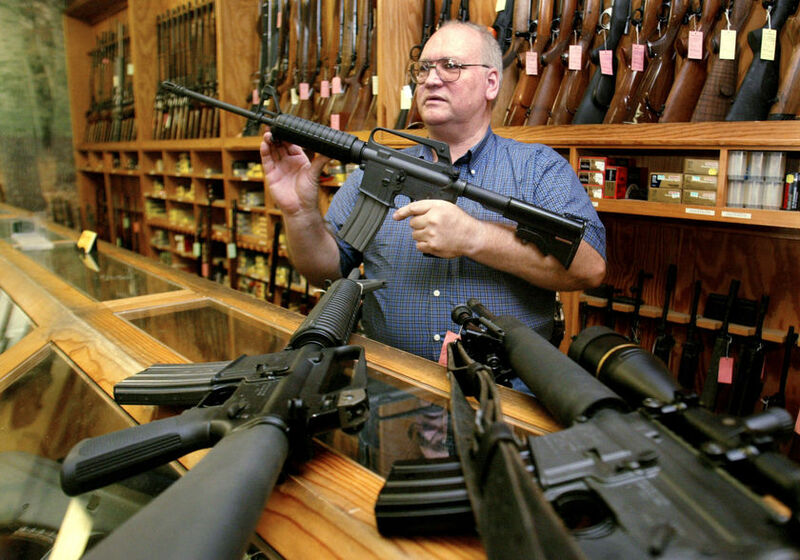 Just think of it: in Arizona a man with noticeable mental problems can go into almost any gun shop, buy a semi automatic and enough ammunition to kill scores of his neighbors, then strap it to his thigh and stroll out into the public street and no one will say a damn word. You're kidding yourself if you suppose that Jared Loughner is the only psychopath with a grudge left in Arizona. "People see it as either guns are going to get banned, or I'm going to get shot," a buyer at the Tuscon gun show told the press yesterday. "Either way, it drives sales." A loophole in the state law allows all gun show attendees to buy guns without a background check. Business was said to be brisk yesterday. In Europe, where it is much harder to legally obtain guns they have one-tenth as many killings per capita as in the United States. The implication is clear cut. It's not rocket science. You work it out. Of course I understand why some people want to own firearms. And if the legal means for doing so is carefully screened and monitored I'm not against it. But can you please explain to me why any law-abiding citizen needs a semi-automatic? Are we facing scores of undead zombies, who'll attack our homes day and night? This is the part I don't get. There's no sense of proportion amongst the pro-gun crowd anymore. They sell more and more deadly firepower to ordinary citizens and lethal mayhem is the most common result. There's reason to be fearful about the future. When U.S. District Judge Susan Bolton put on hold key provisions of the anti-immigrant SB 1070 bill last year she received hundreds of death threats at her court offices within hours of her ruling. In fact, she was inundated with them. In Arizona, where even the most mentally unbalanced person can very easily obtain weapons of mass destruction, shouldn't we be concerned about that still?